Lord Timothy Dexter and the "mesonek Order"
"I am the first in the East, the first in the West, and the greatest philoshopher in the known world"
Alice is doing last minute cleanup on her manuscript, which takes place in Salem, Massachusetts after the Barbary Wars. In doing so, she has been fact checking, which means pouring over stacks of books in search of arcane minutiae right up until I drag her and the Kinko's box, screaming and kicking, to the Post Office. 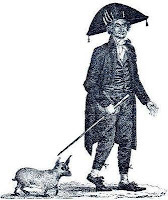 In her reading, she came across a curious eccentric character named Lord Timothy Dexter. Timothy Dexter was born in 1747 in Malden, Massachusetts. He had few skills and very little formal education, but he was blessed with the ability to fall into manure and come out smelling of roses. During the War of Independence, Dexter was on the side of the Loyalists, but began buying up colonial currency, which most people regarded as worthless. When the war ended, the new federal government redeemed the money for substantially more than he paid for it, which yielded him a large fortune. Dexter had the Midas touch. With his new pile of loot, he purchased two ships. Most would have thought it was madness to send a load of coal to Newcastle in England, but Dexter's ship arrived just in time for a coal strike. He sent a load of bed warming pans to the West Indies, where the beds were plenty warm year round. But the local molasses producers bought them, ripped the lids off and used them as ladles. He collected a shipload of stray cats and sent them off to the Indies, where they were quickly purchased to catch rats and mice. A shipment of woolen mittens sent to the islands were purchased by Asian merchants who exported them to Siberia. Dexter eventually moved to Newburyport, Massachusetts, where the social set didn't exactly take him to their hearts. He purchased a large house, which he referred to as a 'palace,' added 'Lord' to his name, and began the sort of project guaranteed to win over the neighbors: the installation of gaudy yard art. He fenced the property, and installed more than 40 large pillars, each eventually topped with life-sized, wooden sculptures of famous international figures, such as George Washington, Thomas Jefferson, Napoleon Bonaparte, English Prime Minister William Pitt (the Elder), and, naturally, himself. He married the widow Elizabeth Frothingham in 1769, but their relationship became strained over the years. So strained, in fact, that began telling visitors that she had died, and that the drunken, nagging woman seen in the house was merely her ghost. His son, daughter and step-children were regarded with similar disdain. Dexter became curious about the world's potential reaction to his own death, and so he did the logical thing. He staged his own demise and threw himself a funeral service, hiding in the next room to eavesdrop on the comments of the bereaved. The mourners discovered the ruse when he and his wife began arguing in the kitchen. Dexter is best remembered today for his literary achievement, a small book called, "A Pickle for the Knowing Ones; or Plain Truths in a Homespun Dress." It contains his personal views on life and society, his town, his home, and his family—all without regard for spelling, grammar or punctuation. The book became so popular that it was reprinted in eight editions. And no, no one has ever really figured out the title. Forbid by the Ghost of his Wife to become a Mason; Makes a contract with the Ghost to quit his estate. TO MANKIND AT LARGE: I Never had the honor to be Long to that onerable mesonek Order. I Noked once, twise, three times, & the gohst Apeared, sade, ‘thou shalt not enter,’ be Cose I have toue much noledge in my head; I sopose had I bin one then should bin to keep open Dors for thivs & Robers; I have Rougs plentey without keeping taven; I Dont want Noe Abrahams, Nor Aney of the order; only fict Ladeys mared, and grat gintel men that belongs out of the town: mared people and fine widders I wish to see, with pleasur, for I wants to marey a fine wider, for I hant had Noe wife for thirteene years next orgest. I gave the gost fore hundred wate of silver to quit the state; grat lawyer passons, the gient of the law, Rote the Contract; the Cose of it was, that mis Dexter, that was, would have my Dafter marey to A bishup --- Cosed the agrement --- the sole Cose, she has two trousteays, which have the money, to deal out the intress, and she is so ginress shee bys hur Neadls; I bys the pins & sifers & all things Else; shee leaves the intress in the hands of the trosteys, I must have a Companon four good by all, at present with glorey. Dexter's book can be read in its peculiar form, side by side with a "translation" (described as the "Split Pickle") at The Official Virtual Seat on the "Noue Systom of Knollege & Lite" Assigned the Notable and Most Noble Lord Timothy Dexter. Thomas Jefferson referred to the men who drafted the Constitution as an “assembly of demigods,” so it was hardly a surprise when Congress decided to immortalize George Washington in a similarly magisterial fashion. Greek symbolism was much admired and sought after in the Federal City, and so it seemed like a scathingly good idea at the time to immortalize the President in suitably mythical fashion. 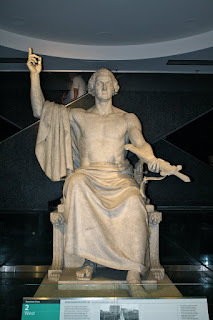 In 1832, the sculptor Horatio Greenough was commissioned by Congress to create the ultimate statue of Washington. It was to be placed in the rotunda of the capitol, underneath the Constantino Brumidi fresco in the dome’s ceiling ("Apotheosis of Washington") which depicted the president ascending among the clouds into heaven, surrounded by thirteen angelic spirits. Enthusiastic fans encouraged Greenough to create what they believed would be the ultimate image of the hero of the Revolution and Father of the Country, with just the proper amount of veneration. What they got eight years later was a representation of George, sitting, with his lower extremities wrapped in a toga, and his torso naked as a proverbial jaybird. Greenough patterned the image after a classical statue of the Greek god Zeus at Olympia, one of the Seven Wonders of the Ancient World. 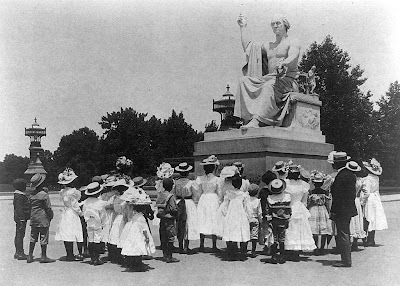 The statue was installed in the rotunda in 1842, where it was almost immediately greeted with hoots of derision. Few had ever really thought of George Washington being naked before. In fact, Nathanial Hawthorne summed up the public sentiment when he said, “I imagine he was born with his clothes on, and his hair powdered, and made a stately bow on his first appearance in the world.” Others put it more bluntly, saying it looked like the President president was emerging from a long soak in a bathtub and reaching for a towel. Equally distressing was that, while it was not quite as big as the original 40-foot statue original of Zeus carved by Phidias in 456 BC, from which it was copied, it sure weighed like it, tipping the scales at more than twenty tons. After a year of sitting in its designated location, it was determined to be too heavy and dangerous to the floor over the underground crypt that had originally been designed for Washington’s body, so the big, expensive embarrassment was moved to a little-seen area outside. When the weather finally began to damage the carving, it was hauled off to the Smithsonian in 1908, and installed in the National Museum of American History in 1964, where it can now be seen giving his solemn Olympian blessing to the second floor escalators. The other side of the throne shows the image of another son of Zeus. The baby Hercules and his twin brother Iphicles are shown in their crib. Their mother, Hera, became so enraged when she discovered Zeus had fathered Hercules by a mortal woman that she threw a snake into their crib. The infant Hercules is shown killing the snake with his bare hands. A five-pointed star is shown over the head of Hercules – an upside down pentagram, in case you’re concerned by such images – with the bottom point of the star touching his head. Fringe author David Ickes has noted that the statue of Washington bears a striking resemblance in its pose to the famous illustration of Baphomet, drawn by French occultist Eliphas Levi. 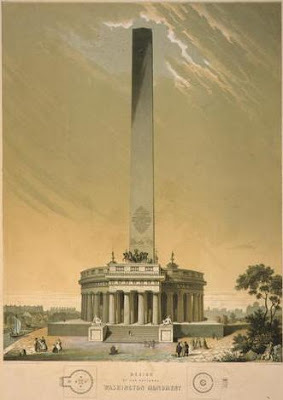 Both have the right arm pointing skyward, and the left pointing downward, in the manner of the alchemical phrase, “as above, so below.” Therefore, Ickes suggests, Washington’s statue is an illustration that he is somehow an evil incarnation of Levi’s satanic imagery. It should be noted that Greenough's statue predates Levi's image by 20 years, which didn't appear until 1860 in his book, 'Transcendental Magic' (and which was never intended to be Satanic anyway). But there is a more plausable explanation that may really capture the peculiar reason for Washington’s odd posture in this statue. The original design of the Washington Monument by Robert Mills (left) was supposed to have been a Greek-style temple, topped by a sculpture of Washington in a chariot, and pulled by six horses. Greenough’s statue looks strikingly similar to the posture of Washington in Mills’ conceptual drawing. The outstretched hand that holds a sword would have actually been holding the reins of the chariot. It is probable that Greenough likely designed the statue as a demo to get the entire commission of Washington, chariot and four horses for the monument. Fortunately, cooler heads prevailed, and a more monumental, if austere, design was actually constructed, sans chariot. Mark Tabbert passed along a message today: "According to museum label, the statue shows Washington handing his sword back to the American people and pointing to Heaven. He is not assuming the role of a god, but of Cincinnatus and arguing that that our democratic republic will survive not by force of will, but by the grace of God." 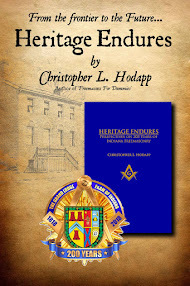 I have stumbled across an incredible resource for those of us involved in the preservation of our old Masonic temples. It is the Church Buildings Maintenance in Scotland project. Obviously written for churches and for the Scottish market, it nevertheless contains a treasure trove of resources for owners of all older buildings, regardless of purpose or location. It is supported by the Church of Scotland, the Bishops' Conference of Scotland, the Scottish Episcopal Church, and Historic Scotland. The massive site has a glossary of architectural terms so you and your roofer or construction company are speaking the same language. It lists articles on maintenance issues, as well as case studies of large projects. The resource download section is the greatest portion of the site, and it is filled with specific articles to address everything from bird control, graffiti removal and metal theft prevention, to roof repair, masonry decay and timber rot. Ever since joining the Temple Board of Indiana Freemasons' Hall, I have entertained the idea of this very kind of website for Masonic buildings. We all face the same kinds of issues, on the repair and maintenance side, as well as on the financial and future planning side. The Grand Lodge of Pennsylvania in Philadelphia has recently completed a major roofing project. The Detroit Masonic Center has been saved from abandonment by an outside investor. The Scottish Rite House of the Temple is undertaking a major repair and rebuilding program to stabilize the building from rotting steel work. The Scottish Rite in McAlester, Oklahoma is undertaking a massive restoration of its collection of historic backdrops. Indiana Freemasons' Hall in Indianapolis is in the middle of an engineering study to determine how to air condition its 8-story limestone building, as well as renovate and modernize its auditorium and kitchen. The Grand Lodge of Tennessee recently passed a per capita assessment on its members of $10 per member, for the next 20 years to renovate its building in Nashville. These types of projects are going on all over the country, in buildings large and small, and all of us deal with the same issues. It would be a tremendous benefit to the fraternity if we could pool our resources and swap success and failures. A nice surprise. Taylor Swift's new music video for her song "Change" was shot at the Indianapolis Scottish Rite Cathedral. Not exactly a huge showcase of the building—it seems confined to the South Lounge. But nice, nevertheless. Good article in the New York Times last Thursday about Masonic buildings and artifacts being put on display in Boston, New York, Philadelphia and Washington DC. See Masonic Lodges Open Those Mysterious Doors. 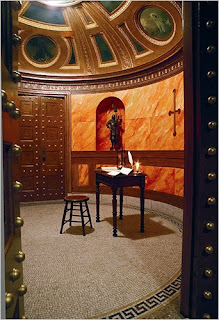 Be sure to check out the recently refurbished Chamber of Reflection at the Grand Lodge of Massachusetts in Boston (photo). I am looking for background information on an author named George V. Tudhope. He penned a formidable stack of thin books, mostly centering around his belief that Francis Bacon was the founder of Freemasonry and the "secret society" that built America. Much of it parallels Manley P. Hall's "Secret Destiny" stuff. Tudhope gets trotted out a lot about this topic, and those who followed in his path seem to be one big circular citing society. 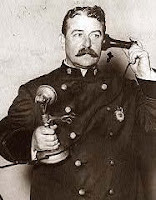 That said, I have no idea who Tudhope was, where he got his information, what his background was, etc. I have two of his works ("Bacon Masonry" [no snickering please], and "Freemasonry Came to America With Captain John Smith in 1607"), but neither has anything about him. Mike Poll passed along some clues. Apparently, Tudhope and Hall were both influenced by Henry R. Evans, editor of the New Age Magazine from around 1915 to 1920. (Evans wrote under the pen name "Mysticus".) Mike says Evans was part of a group that styled themselves "The Dwellers on the Threshold" and included Leroy M Taylor and Harry Houdini. Tudhope was late to the party and started writing in the 1950's, basing some of his works on the ideas of the "Dwellers". 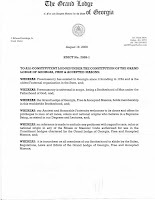 Further, be it resolved, that it is the responsibility of the Worshipful Master of each Lodge constituted under the Constitution of he Grand Lodge of Georgia, Free and Accepted Masons, to insure and enforce strict compliance with this EDICT, and, further, to have it read at the next two communications of the Lodge after receipt by the Lodge. Any Lodge reported in violation of this Edict will be disciplined. Given under my hand as Grand Master of the Grand Lodge of Georgia, Free and Accepted Masons, this 19th day of August, 2009. The Ancient Accepted Scottish Rite Northern Masonic Jurisdiction will confer the 33rd degree on 110 32nd degree Masons next week in Boston, during the annual meeting of the Supreme Council at the Hynes Convention Center. The 33rd Degree is awarded for outstanding achievement within the fraternity or for service to the Scottish Rite. More than 2,000 33rd Degree Masons and their wives are expected to attend from the 15 northeastern and midwestern states comprising the Northern Masonic Jurisdiction. After conferral of the 33rd Degree on Aug. 25, the names of those who have been selected to receive the degree next year in Philadelphia will be announced. This is for those of you who believe the secret 33rd degree is only conferred in secret to a secret select list of secretly selected selectees. It’s official. The Dan Brown Effect is rushing headlong at the Masonic fraternity like an angry lodge goat and will be upon us on September 15th. 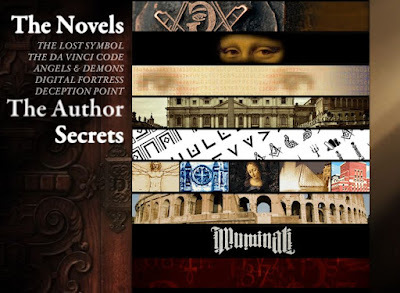 That’s the day 6.5 million copies of Brown’s sequel to The Da Vinci Code, now titled The Lost Symbol, will hit stores worldwide. I think Brown will fish heavily from Manley P. Hall's pond. My guess, based on the covers and a growing list of online clues being released by his publisher on a daily basis (we'll see how I do come September) is that Brown will tell a story of some secret brotherhood (possibly the "Knights of the Golden Helmet"), formed by Francis Bacon. The group discovered America, then sailed back and founded the New Atlantis, a utopian experiment in government that became the United States. This brotherhood eventually became the Freemasons. Within it are the super secret group of string-pullers and evil, bald-headed, cat-stroking, super-criminals—the 33rd degree Masons of the Scottish Rite, who meet once a year in their creepy secret fortress, the House of the Temple in Washington. Murders will undoubtedly ensue, probably at all of those “Masonic” zodiac symbols David Ovason droned on and on about in The Secret Architecture of Our Nation’s Capitol, before he admitted in the last five pages the Masons didn’t actually put them there. That 6.5 million copies is just a dribble in the bucket. Da Vinci Code eventually sold 81 million and was the sixth most popular book in the English language. Let’s say The Lost Symbol stinks on ice. Let’s say just half as many folks snap up this one—a paltry 40 million readers, not counting the Scroogy skinflints who go borrow their roommate’s copy or steal it from the library instead of actually buying it. So let’s be charitable and say another 10 million. That’s a minimum of 50 million pairs of eyeballs reading what pours forth from Mr. Brown’s brain about the Freemasons. Plus all of the tie-in books and TV shows that will add further confusion and misinformation in an attempt to cash in. This is a truly once-in-a-lifetime chance for this fraternity. Not to go trawling in shallow waters for new members, but to educate the public and make sure men know who we are, where we are, and what we offer them. And how to knock on our doors. If we blow this, we deserve to vanish into obscurity. This is a gift that few are given, and it’s being handed to us on at least 50 million platters. Freemasonry has to be giving the facts, setting the agenda, and most important, directing the media to the true experts. These tasks aren’t just a good idea, they’re vital. We have to be there with the truth: a world of others will be out there serving up lies. This isn’t some argument about whether Masonic billboards or NASCAR sponsorships are appropriate. This is a major development that will affect the public perception of Freemasonry for years. Don’t forget that tens of millions of people think they understood what Opus Dei was after they read Da Vinci Code. This could have as much effect on the fraternity as the Morgan Affair or WWII. That is not hyperbole. Masons all over the world need to polish up their ‘elevator explanations,’ and grand lodges need to be prepared for greater interest, and lots of scrutiny. Stonewalling is not the answer. When reporters come calling attempting to get an interview for the 6 o’clock news, we must not fall victim to what we’ve always done in the past: sending a good-intentioned grand master to stand out in front of the grand lodge building to tell the world we have no secrets except a few funny handshakes, that “all” the founding fathers were Freemasons, that we give 2 or 3 million dollars a day to charity, and that we’re having a CHIPS event next week (“No, heh heh. We don’t microchip the kids. Heh heh.”). Don’t forget to mention George Washington. So that is really the next question—how do we get out in front of this juggernaut and make the preemptive strike? 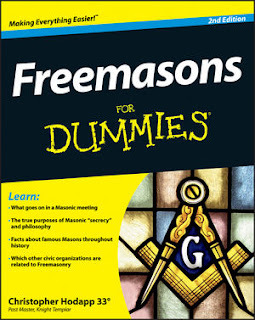 Our official spokesmen had better have read Brown’s book and have the answers for the tough questions, because trust me, every grand lodge and an awful lot of local lodges will be getting these calls on September 16th, and long after that on slow news days. Our people need to know what they are talking about. (“No, heh heh, I haven’t actually read Dan Brown’s book, so I don’t know what you’re asking about, but my granddaughter said it was a real page turner.”). The press isn’t necessarily out to get us. They ARE out to get ratings and sell newspapers. But the reporters themselves don’t know the first thing about who and what Freemasons are. We are an alien species. If they only do cursory Internet ‘research,’ we can appear as a bunch of grumpy old white guys, possibly racists, who can’t even get along with each other at the lodge picnic. Or we’re a bunch of cloistered world takeover plotters. The purportedly serious TV stations aren’t kind to us either. I can think of precisely one documentary on History/Discovery/National Geographic/A&E/TLC in the last ten years that was factually correct, well shot, well edited, and not compelled to put raving madmen on as “counterpoint”. It was made by a Canadian Mason, for Canadian TV, and when it ran in the US, a full hour was chopped out of it. Yet, if we don’t go on these shows, and patiently answer their questions, that crucial job will be handled by the Ralph Eppersons, the Christopher Knights, and the David Ickes, declaring us evil, anti-religious reptilian aliens. The Masonic Society is creating an Internet resource for reporters, curious Lost Symbol readers, and Freemasons alike, that will address the questions raised by Brown’s book. (The site will go live next week.) It will be in partnership with the Masonic Service Association and the George Washington Masonic Memorial. Obviously, we are all mostly in the dark until his book hits the streets on September 15th. But the Masonic Society's goal from the beginning has been to be a research society that educates and stands by the side of regular, recognized Masons, lodges and grand lodges. This is part of that mission. The waves will be coming, whether we agree with why they’re coming or not. Dan Brown’s book will have the same kind of effect on men seeking membership that Born In Blood and National Treasure did, but a thousand fold. How we handle that at the grand lodge and local lodge level will literally determine where the entire fraternity goes. For those who wring their hands and make empty comments about “guarding the West Gate,” there will be no shortage of candidates to investigate thoroughly. This is not just a grand lodge issue—they’ll be pounding on the doors of your Mother Lodge. How will you and your lodge present Freemasonry to them? Be ready. We fail to prepare at our own peril. The 64th Knights Templar Triennial Conclave has been going on in Roanoke, Virginia this week. Almost 400 Sir Knights gathered at the Hotel Roanoke for drill team competitions, elections and general business meetings. There were 377 voting members representing 47 states and 6 foreign countries. William H. Koon II has been elected as the Most Eminent Grand Master, Grand Encampment of Knights Templar of the United States of America. David Godwin has been elected as the Right Eminent Deputy Grand Master, and Indiana's Duane L. Vaught has been elected as the Right Eminent Grand Captain General. Indiana was well-represented at the Triennial by Grand Commander Larry Brown. In the Class 3 Drill competition, Greenfield Commandery No. 39 took 3rd place, and my own Raper Commandery placed 5th. Commanders Terry Terhune and Carson Smith worked together this year to share drill team members so both commanderies could place teams on the floor. There is talk of working on a battalion-wide level next time to be sure there are A and B teams three years from now, as well. This kind of cooperation could go a long way to keep drill team competition alive, if, for instance, commanderies put together C teams, battalions B teams, and states A teams. Note that there was only one A team at the triennial this year. Indiana Knights Terry Turner, Phil Whisner and Gary Messer spent Sunday evening touring the hospitality suites in their medieval Levant Preceptory kit, spreading the word about how steel helmets, broadswords and chainmaille are generating new interest in Templars looking for something a little more unusual in their commandery. The reduced interest in drill teams evidenced this year is a barometer that shows new men coming to the door of our asylums aren't wanting to be Templar Knights out of a desire to march in formation. The biggest challenge that faces all of the York Rite bodies is keeping members participating. The York Rite arguably has some of the best written, and most affecting degrees in Masonry. But once the degrees are conferred, we all have to make damn sure there's a reason for men to come back next month. And jamming them into an officer's chair is NOT the way to do it. Unique, entertaining, interesting programming, table meetings, speakers, papers, historical presentations, road trips, cooperation between chapters for degree conferrals—we need to try everything we possibly can. I spent most of my days hanging out selling and signing books, meeting Knights literally from around the world—Togo, Romania and France were among the countries attending this year. Many thanks to the brethren who joined The Masonic Society this week. After some conversation with Mark Tabbert and George Seghers of the George Washington Masonic Memorial, we'll have a new development to announce in the coming weeks concerning the Society and the Memorial's digital archiving program. For photos of the event, Sir Knight John Westervelt of Winchester, Virginia will be putting up an online photo album (check back if it is not up yet). Go to www.seeyourphotos.net , enter as the event "64th Triennial Conclave" and password "20060644"
Our road trip plans have changed a little bit, as we roll through the Virginia countryside in the Dummies Urban Mobile Assault (DUMAss) Command Center. We'll be in Williamsburg and Washington DC the rest of the week, through the weekend. I'll be at the 64th Knights Templar Triennial Conclave from Saturday afternoon 8/15 through Monday 8/17 at the Hotel Roanoke, cheering on my fellow Sir Knights from Raper Commandery No. 1 in the drill team competition, peddling books and taking new applications for the Masonic Society. I'll be in the vendor's area, so be sure to stop by the table and say hello. 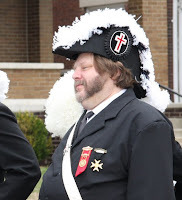 There's a rumor a Knight from Indianapolis' Levant Preceptory in full medieval regalia may be roaming around Duane Vaught's hospitality suite in the evenings, if I can still squeeze into my chainmaille. Then Tuesday we break camp and head to Alexandria and Washington DC for a couple of days, working on a pair of super-secret projects. With Dan Brown's book The Lost Symbol displaying the double-headed eagle and 33rd degree shield of the Scottish Rite on its cover, along with the release date of the book 9/15/09 adding up to the number "33," it's a fair bet to say that Brown will place 33rd degree Masons in an important role in his novel. Good or bad remains to be seen. And since literally millions of people will read it and think Brown's version of Freemasonry and the Scottish Rite is "factual," as he has claimed in the past about his treatment of the Illuminati, the Priory of Sion, the Knights Templar and Opus Dei, I figured it was worthwhile to post a brief explanation of just who and what the Scottish Rite is. The Ancient and Accepted Scottish Rite is an appendant body to Freemasonry, requiring membership in a Blue Lodge (the local, neighborhood lodge). The Scottish Rite confers a series of Masonic degrees numbered 4 through 32. In the United States, these degrees are conferred as a series of dramatic plays which illustrate certain moral and philosophical lessons. To become a 32° Scottish Rite Mason in the U.S., it is not necessary to witness or participate in all 29 of the Rite's degrees. A candidate might participate in, for instance, the 4th, 14th, 18th, 30th, 31st and 32nd degrees, but not the others in between, yet is still considered a 32° degree Mason. Because the degrees are literally major theatrical productions that require large casts, props, scenery, lighting and music, not all of them are presented at one time for every class of candidates. In addition, he might simply receive a brief lecture or explanation of a degree, be shown its signs and passwords—this is called "communicating" the degree. Many Scottish Rite valleys rotate the presentation of the other degrees over a period of years so a candidate can eventually see all of them. But as long as he has had the 32° conferred upon him, a man is considered a 32° Scottish Rite Mason. This is very different outside of the U.S. An American Scottish Rite Mason can attain the 32° literally in a day or two of degree presentations. Outside of the U.S. this process can take years. In some countries, rising above the 18° is very rare and time consuming. In addition, the Scottish Rite confers a 33rd degree, “Inspector General.” This is an honorary degree for Scottish Rite Masons who have made a significant contribution to society or to Masonry in general. Far from a “secret,” recipients are announced in public newspapers, and are entitled to place 33° after their name. 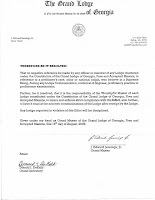 Those who are elected to serve as part of the Supreme Council's governing board must be 33° Masons, and are known as “Sovereign Grand Inspector General.” The top officer of a Scottish Rite jurisdiction is a Sovereign Grand Commander. You will sometimes read the term "high degree Masonry" or "a high ranking Mason." I don't care what you read anywhere else. Regardless of any other Masonic organization a Freemason may join in his lifetime, and no matter how any other organization may describe or number their degrees, there is no degree of higher rank or importance in Freemasonry than the 3rd degree, the Master Mason. The Scottish Rite degrees are comparable to continuing education, not higher authority. A grand lodge allows the Scottish Rite to operate in its jurisdiction, but has the authority to tell Masons they may not join or participate in the Scottish Rite. This is the delicate dance of Masonic authority. While we're discussing misnomers, despite its name, the Scottish Rite is not really Scottish, but primarily French and a little Austrian. The name is believed to have come from the influence of Scottish Jacobite Masons living in exile in France in the early 1700s. And no, you don't have to be Scottish to join. The territory of the U.S. is divided into two governing Scottish Rite bodies. The Supreme Council of Ancient Accepted Scottish Rite of the Northern Masonic Jurisdiction governs the Rite in 15 states, roughly north of the Mason-Dixon line and east of the Mississippi. It is headquartered in Lexington, Massachusetts. The Supreme Council of the Ancient and Accepted Scottish Rite, Southern Jurisdiction was first formed in Charleston, South Carolina, and is now headquartered in Washington D.C. It’s building is known as The House of the Temple, and is located at 1733 16th St. NW. The Southern Jurisdiction governs the remaining 35 states. Regional chapters, called "valleys," are located across the country and are far less numerous than Masonic lodges—there are generally no more than four or five per state. There are great differences between the Northern and Southern jurisdictions in terms of the degree rituals they confer on their members. There are even differences in degree names, in spite of the fact that both confer degrees numbered 4 through 33. The rituals worked by the Southern Jurisdiction were extensively rewritten by Albert Pike in the 1850s. While they have simplified the work over the years (largely shortening the rituals and clarifying the language), today's degrees are revised versions of Pike's rituals. The Northern Jurisdiction never adopted Pike's rituals completely, although at various times they used a few of them. Instead, the NMJ has modified its work over the years on a regular basis, writing new rituals and modifying old ones to keep them, in their view, more relevant. As a result, while Pike stuck with stories drawn from biblical and chivalric sources, the NMJ has added patriotic stories about George Washington, Ben Franklin, and (although not a Mason) Abe Lincoln. Those influences have waxed and waned over the years—Washington and Lincoln degrees have been removed recently—but the two jurisdictions are VERY different in their ritual approaches. The Northern Jurisdiction has recently revised and made available an updated history of its degree development on its website. See The Degree Rituals of The Supreme Council, 33°, AASR for the Northern Masonic Jurisdiction United States of America by C. DeForrest Trexler, 33°. Of the 1.5 million Freemasons in the United States, approximately 500,000 are Scottish Rite Masons. Not to unduly drag this story back out into the light, but the Associated Press and several New York papers are reporting it today. Ronald H. Tills, 74, of Hamburg, was sentenced Friday in federal court to 18 months in prison after pleading guilty last year to transporting prostitutes across state lines. Tills is the third man to be sentenced in connection with a federal prostitution sting involving local massage parlors. Two other defendants — retired Lockport Police Captain John Trowbridge, 62, and Tills' former law clerk, Michael Stebick, 61 — had previously been sentenced. Trowbridge received two years’ probation, and Stebick was given four months home confinement. The men were all members of the Royal Order of Jesters, an international fraternal society. Tills admitted last September to violating the Mann Act by transporting prostitutes across state lines. Trowbridge pleaded guilty to transporting the woman, an illegal alien identified in court papers as “Jane Doe No. 1,” to Kentucky, to engage in prostitution with members of the Royal Order of Jesters. As part of his plea, Tills admitted to five additional occasions of transporting a woman across state lines for prostitution. Allegations of prostitution led the Western District’s Human Trafficking Task Force and Alliance to conduct raids on four massage parlors in Lockport, Niagara Falls, Wheatfield and Tonawanda in December 2007. The women working at the massage parlors were illegal aliens from Asia. Nine women were rescued from the parlors, where investigators said they were being held as virtual captives. So far, no charges have been filed against anyone outside the Buffalo chapter. In May, a national spokesman for the Jesters told The Buffalo News that the presence of prostitutes at Jesters gatherings is something that only the Buffalo chapter engaged in, adding that such conduct is never condoned by the national leadership. The all-male organization — which is a division of the Freemasons — has 191 chapters with 22,000 members, mostly in the United States. The fraternal group's members have included two U.S. presidents, politicians, entertainment figures and prominent businessmen. 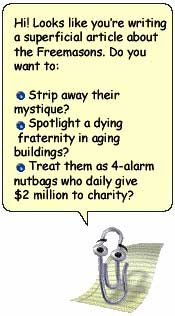 Some former Jesters told The News that many Jesters chapters have engaged in wild parties with prostitutes for decades. Tills, who previously served as a member of the State Assembly, was known by colleagues and defense attorneys as one of the region's toughest sentencing judges before he retired from his job as a state judge in 2005. The Lost Symbol and Mount Vernon? I spoke with a very nice spokeswoman at Mount Vernon today. She informed me, after fielding several other calls about the article in The Scotsman about Dan Brown's The Lost Symbol, that their security department wasn't aware of anything like this until today's article, and they were planning nothing special to keep Dan Brown fans from busting into George's burial vault. Of course, perhaps I'm reading Bob Cooper's quote incorrectly. Perhaps he means in the novel Mount Vernon's staff is afraid of the Rosslyn Chapel effect hitting George Washington's home. 'The Lost Symbol' looks set to create a huge uproar across the USA, with its allegations that far from being the country's 'founding father,' Washington was actually a traitor who had been secretly negotiating with the British during the American War of Independence. His treachery – revealed in a deathbed confession – was apparently concealed by his fellow Freemasons. Worse still, assertions that the original confession was concealed in George Washington's coffin is creating panic around the grounds of Mount Vernon where Washington is buried. Historian Robert Cooper, curator of the Grand Lodge of Scotland and a world authority on Freemasonry says, "It seems they're planning security precautions to safeguard against what has become known as the 'Rosslyn effect,'" referring to the way that, after the publication of Brown's bestseller 'The Da Vinci Code,' Rosslyn Chapel in Midlothian was deluged by grail seekers and treasure hunters. "Of course I could be the victim of a double bluff but I don't believe so. My knowledge of the source convinces me of its reliability, and of course there is some conjecture on my own part, based on the comprehensive knowledge I have of the background to the story." It seems that in 'The Lost Symbol' Washington has been working with Arnold and passing secrets to the British. But why on earth would Washington want to subvert the cause of American freedom? "Ah, that I'm not clear about," admits Cooper. "I don't know what Brown has up his sleeve there, but I've been led to believe he's suggesting George Washington could be bought like anyone else, and the English Tories had made him an offer he couldn't refuse. When Arnold was rumbled, Washington did a huge about-turn, covered his tracks and wholeheartedly embraced the cause of American independence." The rest, as they say, is history – except that in the novel, it appears Washington has a crisis of conscience on his deathbed and writes a detailed confession to be published after his death. His personal physician and friend, Dr James Craik – also a Freemason – is known to have attended the dying president, whose sealed coffin is buried at Mount Vernon. In true Dan Brown tradition, details of the confession and the events surrounding it have been hidden somewhere, and veiled references to it are found a couple of centuries later by a researcher working at Mount Vernon. He seems to think something highly secret and important has been buried in Washington's coffin. This secret – and the details surrounding it – have been concealed within Freemasonic codes of reference and the researcher can't make sense of the symbolism disguising what he knows is a significant find. He contacts symbologist Robert Langdon but is murdered before he can explain his findings. Langdon, the CIA and the FBI are now in a race to find the confession, which the secret services must destroy to safeguard the integrity of the country's founding father and the creation of the world's first democracy. 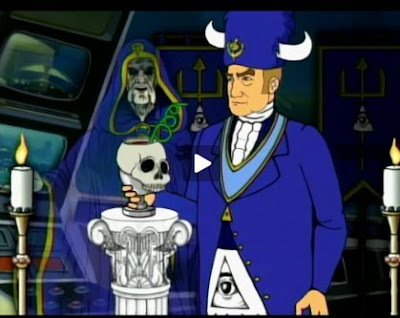 Langdon is the front runner since he's been contacted by a high ranking Freemason with knowledge of the symbolism of the Order. Apparently there's a surprise twist when it comes to the identity of this Freemason – a twist which has more orthodox members of the craft siding with the CIA and FBI in suppressing the truth. "If this plotline is anywhere near accurate," says Cooper, who insists again that he has no reason to doubt his source, "then it's going to create a huge uproar across the USA." I will simply add that the clues released by Brown's publisher on Twitter and Facebook so far don't seem to lead in this direction. But we'll all know soon enough. Atlanta's Gate City Lodge No. 2 has announced on its website that the Grand Master of Masons in Georgia, Most Worshipful Brother J. Edward Jennings Jr., will be present for an official visitation at their stated meeting on Tuesday, September 15th. I am looking for some suggestions concerning stage drops. The Scottish Rite in Detroit moved out of the Detroit Masonic Temple a few years back. They left the stage drops hanging for us, as they had no need for them that large at their new home. We like the drops and have taken an inventory of what is hanging in the theatre. We have 100 lines. The full size drops are at least 45 feet wide. I have not measured how tall yet. But it appears that they are about 30 feet or so tall. In early September we will take a digital photo inventory and place them on a web page for all to view. We have a management company that is operating the Temple for us. They have told us that they are trying to book shows in that theater and depending on what is booked, we may have to move some of these drops to make room for drops for the shows that are booked. So we have to be ready to decide what we want to do. They were made by McDonald Stevens of New York in or before 1926. So at 83 years old I have to think they are somewhat fragile by now. We have a third theater on the top floor, that was never finished nor has it been used.The stage does not have lines installed. Otherwise we would just move them up there. I need to know if there is anyone who preserves these SR backdrops??? Is there a museum for them? Is there a SR or other Masonic group who may be looking to buy some. We probably would like to keep some of them to use as backdrops for other business in the room, like a wedding, a corporate meeting, or a church service. But we may have to move some to make room. I have to think also that folding them would be a no-no. They have hung for 82 years and I would think folding could ruin them. So if any of you have any suggestions or idea, or experience to share with us, please post your thoughts. Cory Sigler passed along a note that I was quoted in Entertainment Weekly on July 17th about Dan Brown's The Lost Symbol: "Decoding Dan Brown." On July 7, Dan Brown fans made like Robert Langdon and began decoding the cover art for Brown's The Lost Symbol (Sept. 15). We gathered their theories and asked Chris Hodapp, author of Solomon's Builders, for his. 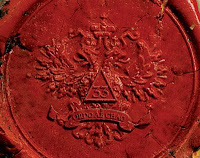 Red Seal: Fans point out its similarity to the seal of the Scottish Rite, a branch of Freemasonry based in part in Washington, D.C. The number 33 — contained inside the triangle — alludes to a high ranking in that branch, says Hodapp. Background Glyphs: Some speculate that these symbols simply serve as wallpaper, but Hodapp thinks they may have been drawn from alchemy or the zodiac. The Capitol: Brown's third Langdon novel follows the professor on a 12-hour adventure in D.C. ''I suspect there are places in the city's architecture that have signs of the zodiac built in,'' Hodapp says. ''That would be a good starting place for the plot points.'' And for rabid fans who can't wait for Sept. 15. Someday, I'll get accurately quoted. (They called me on my cell phone while I was paying for a piece of furniture.) What I said was that I hadn't seen the cover art close up at that point, but I predicted Brown will situate a series of murders (probably politicians) at the architectural zodiacs that appear around Washington DC that David Ovason talked about for hundreds of pages in his book, The Secret Architecture of Our Nation's Capitol, claiming Freemasons had designed them into the city plan, until he said at the end the Masons really had nothing to do with them. And that Brown would probably attempt to make 33rd degree Scottish Rite Masons into the bald-headed, cat-stroking evil geniuses behind some nefarious plot. And I have never said 33rd degree Scottish Rite Masons were "high ranking" except in jest. I told the young lady that many people have this common misconception. She went right on to misconceive it. As for Brown, we'll all know on September 15th. "I greet you from the deeps, where Neptune never sleeps." If you have a properly twisted sense of humor, the "Neptunati" episode of Sealab 2021 is up on what looks to be an official Sealab website, instead of pirated on YouTube. Stormy’s meddlesome inquisitiveness uncovers Shanks’ membership in a world-controlling society as a Brazen Potentiary of the 33rd Degree in the Exalted and Supreme Brotherhood of Neptune.